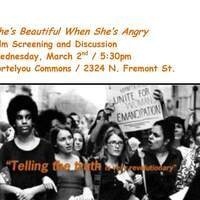 In celebration of Women's History Month, join The Women's Center and the Women's and Gender Studies Department for a screening of the documentary film, She’s Beautiful When She’s Angry, that resurrects the buried history of the modern women's movement from 1966 to 1971. Amazing historical footage of meetings, speeches and rallies of the time are juxtaposed with photos of many of these same women today, now in their 60s and 70s, relishing the memories. One of the women in the film, Vivian Rothstein, a co-founder of the Chicago Women's Liberation Union will lead the discussion following the movie. Two DePaul students will offer young women's commentaries on the film and the relevance to women's issues and activism today.